March 28, 2019 | By Steve Hollman B.S. If you’ve ever thought about becoming a health or fitness professional, you’re not alone - the U.S. health coaching industry was worth $6.14 billion in 2017, up 15% from 2014. That staggering growth shows no signs of stopping with experts estimating the market to be worth $7.85 billion by 2022, with 121,000 coaches practicing. Trainers have the opportunity to make a great living in fitness. Of course, your income will depend on where you live, the clients you take on, and how you structure your business. However as of 2018, fitness trainers made an average of $39,210 annually, but some report making $72,933 and beyond. Another reason to join the industry? People are much more likely to achieve their goals with your help. The American Society of Training and Development (ASTD) found that people have a 65% chance of completing a goal if they commit to someone. Odds increase up to 95% if they have a specific accountability appointment with the person they’ve committed to. Training sessions, virtual meetings and other interactions with a fitness professional totally count. As an online coach or trainer, you have the ability to work from wherever you’re located. Programming, meal planning, and even meetings can take place as long as you have an internet connection. 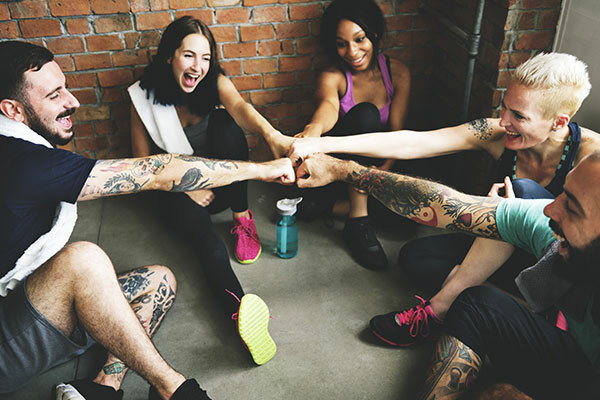 If a face-to-face connection is more your speed, there are so many gyms, health facilities, and restaurants available for you to meet with clients. Plus, if you’re in a pinch, training can take place almost anywhere with a little space and creativity. According to a recent survey, about 58% of U.S. adults say that most days they should probably be eating healthier. Coaches and trainers can educate and advise people on data-backed methods from improving their eating habits. Starting a new career conjures feelings of fear and insecurity for so many of us. We have families to support and bills to pay. Luckily getting your start in the health and fitness industry doesn’t mean you need to make major sacrifices. There are so many high-quality certification programs you can take online without any major disruptions to your current daily life. More than three-quarters of U.S. adults said that being in shape and looking good were "very important" to them. What’s more, 60% of Millennials work out on a regular basis, and 73% say physical appearance is important to them. Trainers and coaches can support people already interested in improving their fitness and appearance in a healthy, sustainable way. Weight is by no means an all-encompassing measure of someone’s health. That said, nearly 1 in 3 Americans are either overweight or obese. For those who are interested in losing weight, trainers can be a major source of guidance and support. Breaking into the fitness and health field means you can get on the path of becoming an expert. Unfortunately, many people dole out low-quality or untrue advice, especially online. Experts who are actually educated are an asset for publications, researchers and other people just looking to find reliable information. In recent years, our society has experienced an increased focus on wellness. This shift has come with an increased willingness to invest in wellness-related products and services. Given the increase in demand, coaches and trainers can more easily offer their services to those who want them. Are you the go-to person friends and family look to for words of support? When it comes to coaching and training, inspiration and encouragement is an essential component. Whether it’s cheering a client on through one more set of pull-ups, or offering genuine words of advice if you consider yourself an inspirational person this could be the right time for you to dive in. Yoga? Weightlifting? Should I choose a ketogenic or a plant-based diet? The internet and social media have made insight into different lifestyles and routines much more accessible. People who are looking to try out a new practice can call on a coach or trainer to help them out. As a health and fitness professional, you are always evolving. Research and science in the field are advancing every day, which creates ample opportunity for professionals to learn and sharpen their skills. This constant evolution makes it difficult for you to stagnate or become bored. Being a health and fitness professional means you don’t have to be chained to a set schedule. Unlike many “traditional” or “nine to five” jobs, your work can take place during whatever hours suit you. This is especially advantageous to those who have childcare responsibilities or simply want flexibility. Physical activity is scientifically proven to benefit human health and overall wellness. Not only does it stave off disease, even a small amount of exercise may increase happiness. People who understand these benefits can educate others on how they too can tap in and access the positive effects of exercising. We only get one body to live in. Our health is such an important factor in living a happy, fulfilled life. Professional coaches and trainers help people improve their overall health in a supervised, meaningful way which makes a real difference in the life of others. Tracking progress and achievement is integral in any job. However, for coaches and trainers defining success metrics and helping people stick to them is key. Goals will vary per person - someone looking for fat loss may also care about their mile time - but they are needed nonetheless. If you know you love to help others set goals, the health and fitness space might be your sweet spot. There’s no greater reward than helping others and seeing the direct results. People who receive services and training are often very appreciative of the help they receive. Becoming a coach or trainer allows you to connect with people every day (if you want to). By connecting with like-minded peers and clients, the industry opens up the chance to meet amazing people locally and around the globe. Gone are the days that you need huge marketing budgets to get the word out about who you are and what you offer. Industry professionals can take advantage of their website, e-mail, social media, and other online platforms to reach their target audience en masse. Many of our graduates have had personal experiences that started them down the path of health and fitness, like a weight loss journey, a sidelining injury, or perhaps digestion issues to name a few. Though it’s not recommended to provide advice from anecdotal experience alone, when combined with science and education, sharing your story can be a great way to relate to clients. While we’re using “health and fitness professional” as an all-encompassing term, there are so many different directions you can take in your career once you’re certified. Certified professionals enjoy thriving careers in group fitness, personal training, nutrition coaching and so much more. Check these options out to get inspired. Education doesn’t have to come with a physical classroom or endless hours of studying. Affordable, quality health and fitness programs can be completed online and at your pace. AFPA specifically offers courses that can be completed in 6 months or less, meaning you can be on your way to jump-starting a new career in short order. If helping others lights you up, now is your time to shine. Once you’re certified you can work with the people who make you happiest - whether it’s teenagers, elderly folks, those suffering from eating issues or another group altogether. Last but certainly not least, you deserve a career that makes you excited to get out of bed every morning. The health and fitness industry can be a fantastic stepping stone to achieving that. If you’re ready, we’re dedicated to helping you get the resources you need to succeed and join the other 110,000+ professionals we’ve certified so far. Take a look at our education programs and be sure to subscribe to the blog for all things health and fitness related!